Measurements: 2.45 x 4.2 inches, or 63 x 107 mm. Back of card: Deep blue with white edging & a thin gold band separating the two. In the center, the circle of Zodiac signs (Libra ascending) & in the center of a circle, a leaping stag with the word, Modiano, underneath. Can be inverted if you're not fussy. Booklet included: Yes, 68 pages, 2.25 x 4.1 inches, or 57 x 104 mm. Text by Stuart R. Kaplan. Publisher: Modiano, distributed by US Games. Printed in Italy. Comments: According to his memoirs, Alessandro Cagliostro was born in Malta of a noble but unknown family. He was reared & educated in Arabia. His exact dates are mysterious. He seems to have flourished between 1740 & 1790. For some time he was confused with one Giuseppe Balsamo, a common criminal. In Parisian society he was a precursor to the celebrated Comte de Saint German, whom he knew. Cagliostro attempted to establish (or reestablish, perhaps) a Masonic/Rosicrucian Freemason society. He was perhaps as well an agent of the mysterious Knights Templars. The stories told about him are fantastic & murky. He was imprisoned both by the Church in Rome (for having founded a Masonic Lodge there) and by the French in the Bastille. His ultimate fate is unknown. It is said he perished in both prisons (as unlikely as that can be). It is also said he escaped & fled to India. These notes are taken from Manly Hall's massive Secret Teachings of All Ages. To the Theosophists, Cagliostro is the previous incarnation of H.P. Blavatsky. A comparison of their lives is instructive. Hall does not say if Cagliostro used tarot cards, we can leave that to the imagination. At any rate, it is unlikely he used these cards, as there are three distinct styles in this deck. The Pip Cards are taken straight from the Marseilles-type decks & are very ancient. The Face Cards, eg, Kings, Queens, Knaves & Pages, appear to be early versions of modern playing cards. They are all half cards & when inverted appear identical to their upright position (it's only the number in the round circle at the top that indicated upright or reversed). These also appear quite old. The Major Arcana cards appear entirely modern. In the notes with this deck, Stuart Kaplan says the major arcana cards were designed in 1912 by Bruno Sigon, who was inspired by Papus & Gabriel Goulinat. 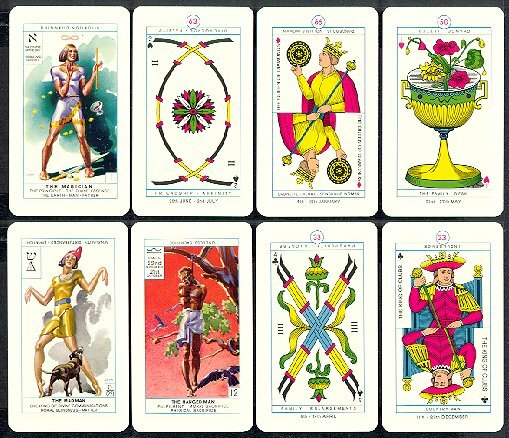 In addition to the usual symbolism, the minor arcana cards are numbered (23-78) & in addition to the usual Cups, Pentacles, Wands & Swords, are also designated as Hearts, Diamonds, Spades & Clubs. Each of them are also designated with a week of the year. The major arcana cards have Hebrew letters. Some of them have zodiac signs, others have planet signs, others have no astrological sign (the Magician) & some have their own mysterious sign (Death). On each card are printed keywords, both upright & inverted. This last touch seems an effort to popularize an otherwise subtle deck.